A new report from Gartner suggests that the use of 3D printing to produce living tissue and organ, or 'bioprinting', is advancing so quickly that it will spark a major ethical debate on its use by 2016. The report also suggests that the market for 3D printed non-living medical devices, such as prosthetic limbs, is likely to boom by 2015. 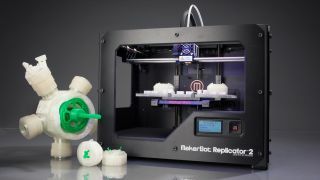 By way of example, Gartner cites the invention last year of the biomaterial 3D printer Regenovo by Hangzhou Dianzi University in China, which was used to print a small working kidney that lasted four months. Also last year, a two-year-old child in the US received a windpipe built with her own stem cells. "3D bioprinting facilities with the ability to print human organs and tissue will advance far faster than general understanding and acceptance of the ramifications of this technology," said Pete Basiliere, research director at Gartner. "These initiatives are well-intentioned, but raise a number of questions that remain unanswered. What happens when complex 'enhanced' organs involving nonhuman cells are made? Who will control the ability to produce them? Who will ensure the quality of the resulting organs?" According to Gartner, the demand for 3D printing of customised human anatomical will continue to grow, especially in areas of weak economic standing and conflict. Demand will be further driven by increasing familiarity within the material sciences and computer-augmented design services sectors. "The overall success rates of 3D printing use cases in emerging regions will escalate for three main reasons: the increasing ease of access and commoditisation of the technology; ROI; and because it simplifies supply chain issues with getting medical devices to these regions," said Mr Basiliere. "Other primary drivers are a large population base with inadequate access to healthcare, in regions often marred by internal conflicts, wars or terrorism."